This splendid machine was not listed in the general Sunbeam catalogue: a frame as large as 28 inches required a special order. This one was purchased second-hand by Dr. Poole when it was a few years old. 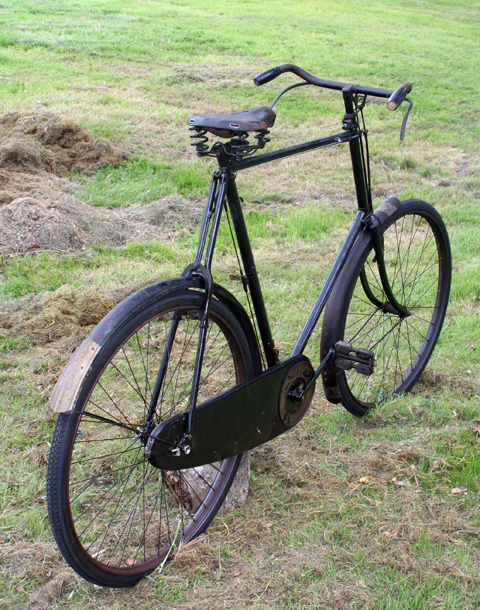 Between 1920 and 1926 he was a medical student at Barts Hospital, and he bought the bike to ride from High Holborn to his home in Teddington. According to its history file, it was sold in the early 1970s for £20 or £25, to Mr. R. Ballantine, who dismantled it as he was determined to restore it. Although he had the frame professionally resprayed, he didn’t get round to completing the job, and I bought it with nearly every single part taken apart! Though it would have made more sense financially to sell the parts separately, that’s not what my friends and I do. 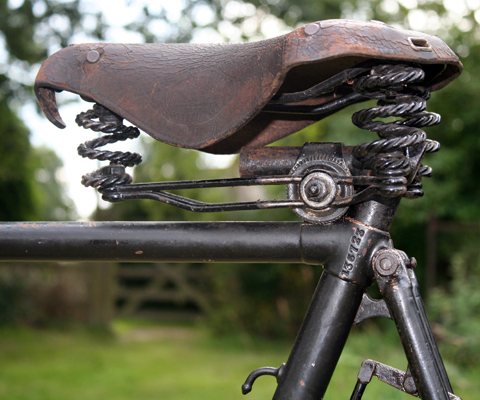 While the ‘breaker boys’ make a good living stripping vintage bikes to sell parts, we prefer to bring bikes back to life. 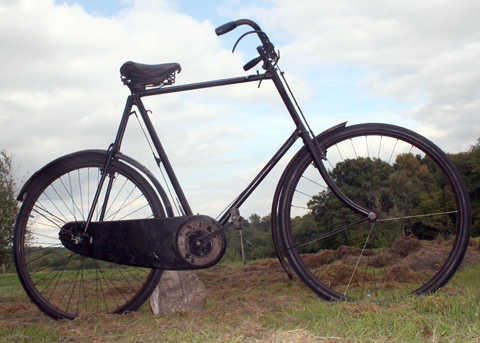 So, after many hours of work, here it is now, restored and ready to ride. During WW1, Sunbeam, like the rest of British industry, prioritized war production. There was, of course, still a demand for bicycles at home. As well as making their military model, Sunbeam also sold their civilian models through the war years, many of which were used by soldiers; a hire-purchase scheme was available on enlistment. 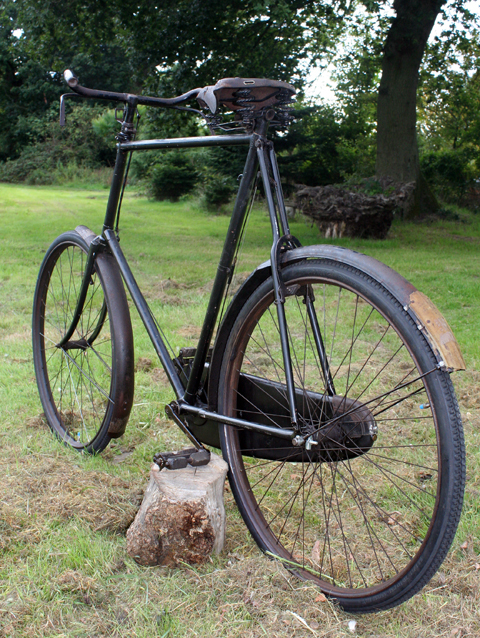 Apart from the Military Sunbeam, the model range didn’t change through the war, and the 1915 Sunbeam, illustrated above, was essentially the same model as this 1918 Royal. WHEN THE BOYS COME HOME: with added zest for the long-deferred pleasures and competitions of the road… declares a Rudge-Whitworth advert on the cover of the March 18th, 1918 issue of Cycling magazine. 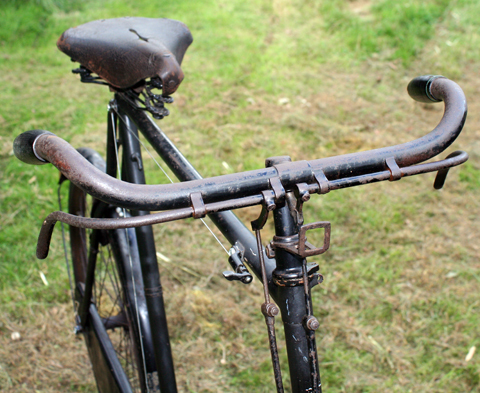 When combatants were demobbed in 1918, overall demand for bicycles increased, although most of the bicycle industry didn’t get back into full swing until 1919. A lot of second-hand machines also came onto the market, sadly, due to the very high death and injury rate during the War. 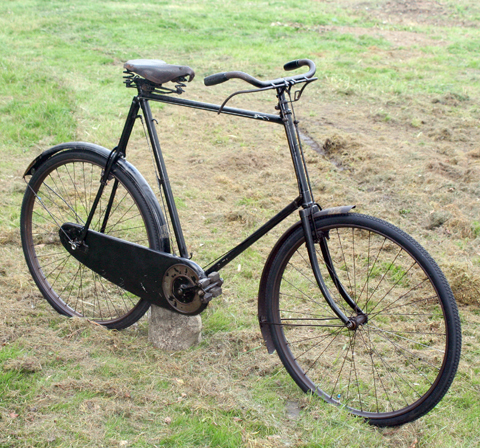 Sunbeam purists consider bicycles manufactured up until this year to be the ‘true’ Sunbeams, as John Marston died in 1918. The company was subsequently purchased by a conglomerate of arms manufacturers who had made a good profit during WW1 and sought investment opportunities. They became Nobel industries Ltd and put a lot of money into new machinery and buildings, which kept Sunbeam at the top of the industry, with the same impeccable standards as before. 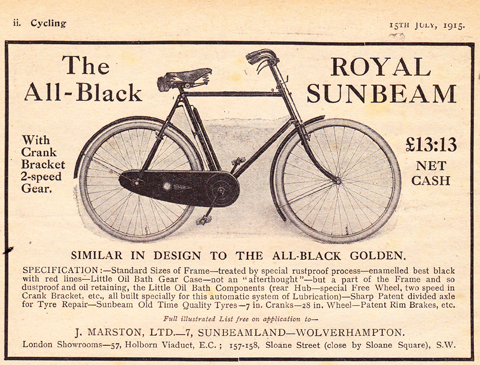 Nevertheless, by 1920, with previously manufactured stock used up, it was, for Sunbeam, the end of the era of ‘the Rolls Royce of bicycles.’ Out went nickel plating on the Royals and the Goldens. There were no more experimental models, and no further radical design changes in the Roadster that had made Sunbeam famous. With its special large frame, this was one of the last ‘Rolls Royce’ Sunbeams. A frame this large is suitable for someone 6′ 4″ or taller. You can see the frame number 136723, which tallies with the year 1918 (confirmed by the Sunbeam book and the marque specialist). 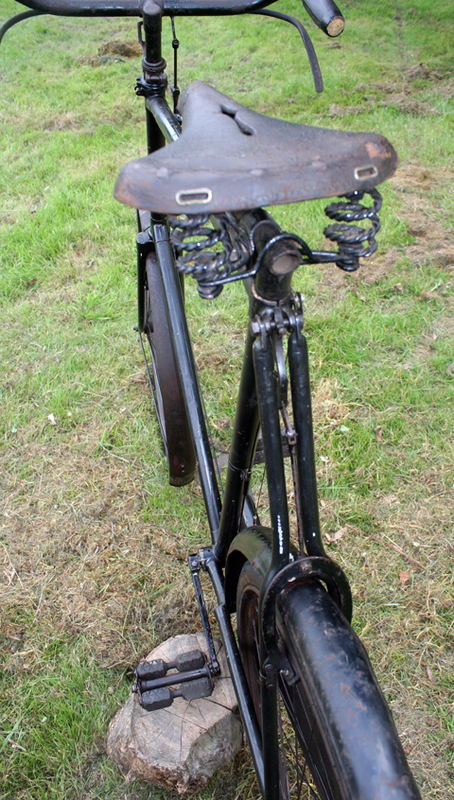 A few parts were missing from the dismantled bicycle. 1. 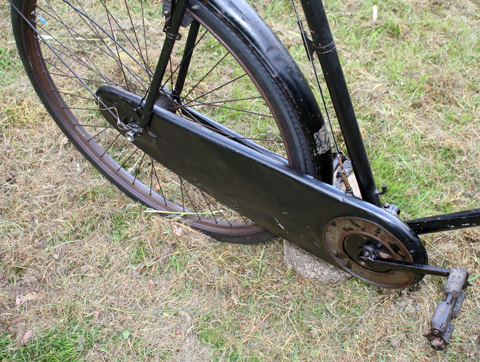 The rear part of the chaincase (a replacement has been made, as you can see below). Also the rear ‘step’ which bolts onto the near-side end of the rear axle; again, a replacement has been installed (below). 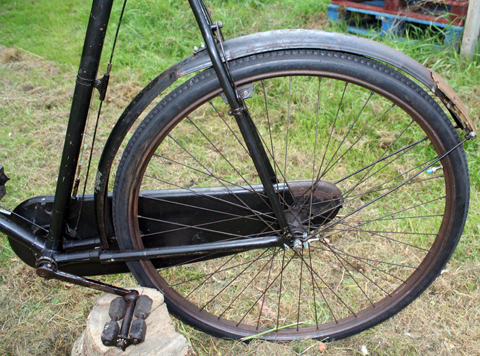 New tyres and tubes have been fitted. 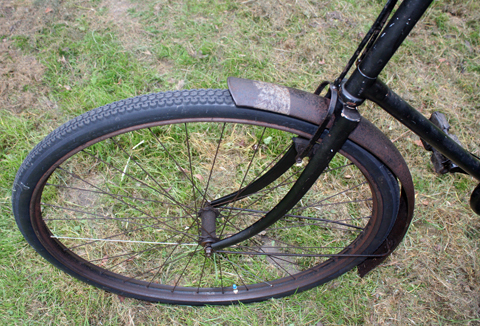 The tyres are good quality modern ones with an old-style tread pattern. 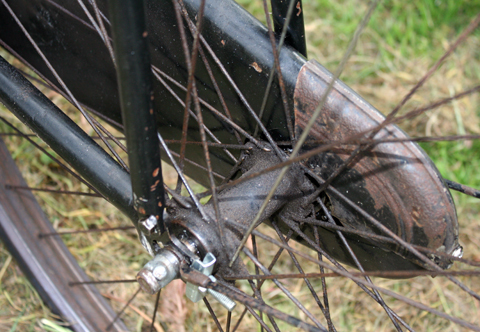 The wheels are unrestored. They are serviceable, but not in top condition. 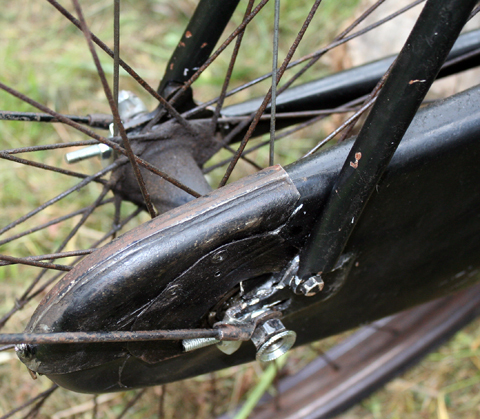 The mudguards are also unrestored. 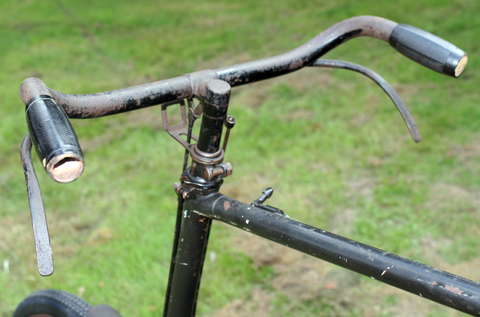 The determining factor in restoring this rare 28″ Sunbeam was that all the original brake parts were with it. Obviously, while re-assembling the dismantled chain-case and gears, it has all been serviced. 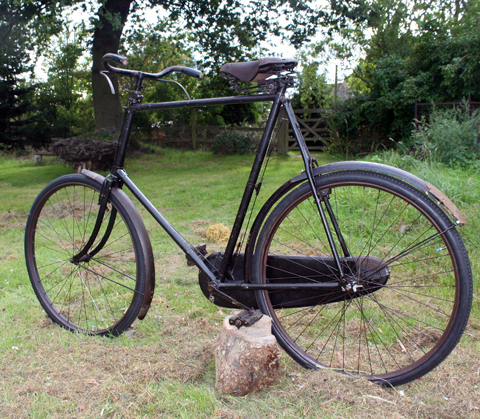 If you’re a tall chap and fancy a good looking, high quality, 92-year-old vintage bicycle, here’s a machine that will provide excellent investment potential as well as an excellent ride. As folks are already discovering, to their annoyance if they don’t have one, and to their delight if they do, prices of pedigree Sunbeams only go up. 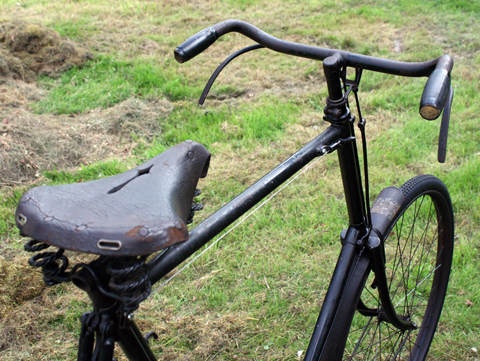 If you can imagine yourself riding high on this Royal, you’d better check its ebay auction while it’s still available.